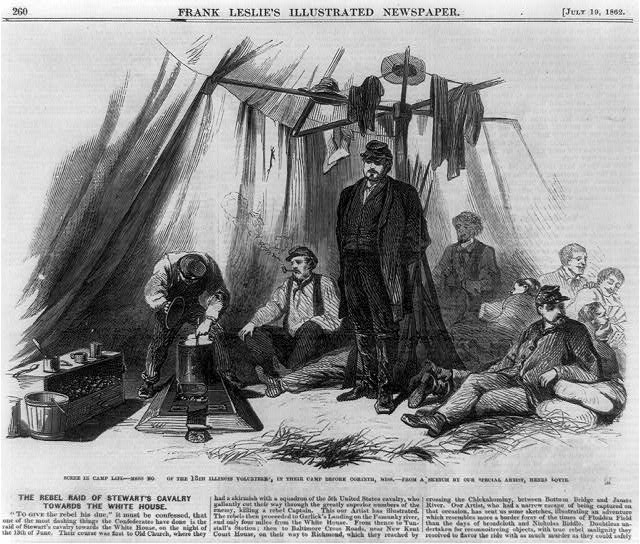 Caption on illustration reads: scene of camp life – of the 18th Illinois Infantry, in the camp before Corinth, Miss. It was about this time last year that I began work on book 3 of the Shiloh Series, Iuka to Corinth and that work is now nearly completed. What of book 2? Book 2, A Certain Death is nearing completion from the remainder of the production process with the cover designer. I do not have a cover to reveal at this point, but will hopefully in a few days. A Certain Death was begun in 2011 and while I was starting Iuka to Corinth I was beginning to edit and rewrite ACD. I learned a lot from the experience of this novel and the rewriting. I learned to listen to the story all over again as I started and stopped and changed directions numerous times with this work. The biggest change was the introduction of Will Hunter, an Alabamian who grows up a reckless and ambitious son of a white trash blacksmith who is not content to stay white trash himself. What made this character interesting to write was his vocation as a runaway slave hunter. He’s good at what he does and he does it without any particular malice, as a lucrative means to rise above his birth. Yet one gets away from him and but for the nagging failure, he neither curses the slave that eluded him or those in Ohio who might be harboring him. He curses the slavers that lord it over men of his standing. Born of an ambition that is not matched by money or birth, Will Hunter finds he cannot escape the slaver class in both pre-war politics and in wartime volunteer militia. His rough and selfish nature has lead him to do things as a boy that he’d rather forget, secrets that he’d like kept secret but for the one man whom he can’t seem to escape, Joshua Kearns. Born of planter blood and privilege and someone who knows Will’s secrets, Will has to deal with this man’s petty and vindictive nature. Philip Pearson and Stephen Murdoch are back in this novel as well as action shifts from the theater of the war in Tennessee through the attempt by Major General Halleck to invest Corinth, Mississippi throughout the month of May, 1862 to the peaceful fields and forests of Ohio, the POW compound of Camp Chase outside of Columbus and the village of Germantown, Ohio. For more news and promotions, sign up for the Shiloh Series mail list. Also, They Met at Shiloh is $0.99 cents this week in recognition of this 151st anniversary of the fall of Fort Donelson.